This volume examines the notions of grammar, rule, and derivation with reference to Astadhyayi as a grammatical device. An attempt has been made to clearly outline and illustrate the basic constructs of the Paninian linguistic theory especially as they relate to the traditional views on the one hand and modern linguistic orientations on the other. A developmental history of the Paninian school focusing on major texts and trend along with a detailed treatment of rule-types, paribhasas, and samasas, complement the discussion of derivational mechanism and related conventions. This book is reprint edition of vol. I, with a translation of rules in the Index and an updated bibliography. In the meantime five volumes have already been published and the concluding volume six will be published soon. Vols. 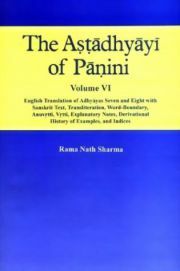 II-VI contain the text of the Astadhyayi with English translation, explanatory notes and complete derivational history of all forms cited as examples by the Kasikavrtii. Bibliographic Information: Reprint Edition of vol. I. 248 Pages.